First-year students who have secured a coveted spot in one of CPUT’s programmes can be assured of gaining relevant skills in their respective fields of study. This assurance was reiterated by CPUT’s Vice-Chancellor, Prof Vuyisa Mazwi-Tanga, who addressed thousands of first-year students during a series of Welcome Ceremonies, held this week on the various campuses. “Our main business is to achieve academic success,” says Mazwi-Tanga. At CPUT, first-years will have access to internationally recognised academic programmes, which has been specifically designed to ensure they gain relevant knowledge and training. The university also boast an impressive array of laboratories and lecture halls, well stocked libraries and first-rate computer facilities. 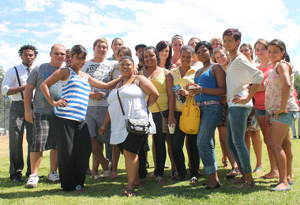 First-year students will also have access to academic support programmes as well as sporting and cultural activities. Prof Mazwi-Tanga encouraged first-year students to work hard and make the most of their time at the university. “Seize this opportunity,” she says. Dean of Students, Cora Motale, who also addressed the students, used the opportunity to urge students to make use of resources on campuses, which will play a role in ensuring their academic success.